The city of Dholera is being developed as a Smart City under the Smart Cities Mission. Dholera Special Investment Region (SIR) once fully developed would be one of the biggest planned urban developments in India with immense opportunities for doing business and living a prosperous and healthy life. Dholera is being developed as one of the futuristic cities not just in India but across the world. 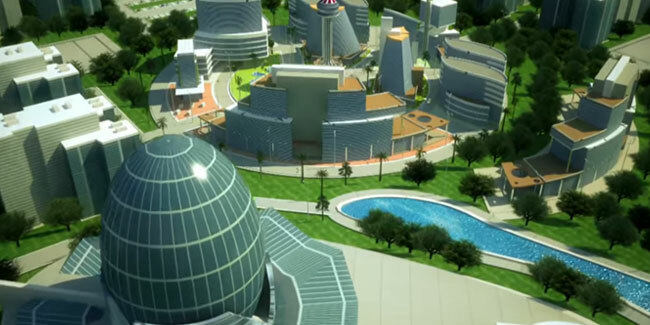 Sandeep Sharma takes a look at the Dholera city development which is being projected as a futuristic city. Dholera is a town in Ahmedabad district, Gujarat. It’s an ancient port city in Gulf of Khambhat, 30 km from Dhandhuka city of Ahmedabad district. The region is surrounded by water bodies on three sides. It’s a port city with easy access to nearby seaports making it a great place for movement of goods through sea route. The city is poised to become a hub for global trading and manufacturing activities. This Greenfield industrial township has been promoted by Dholera SIR Development Authority, and Delhi Mumbai Industrial Corridor Development Corporation (DMICDC). Dholera is one of the fastest growing and would be the first smart city of India. Gujarat is one of the most progressive states in India promoting innovation and industrial excellence. To spearhead economic activity on a grand scale, the Government of Gujarat had decided to create large size Investment Regions / Industrial areas and develop them as Global manufacturing Hubs supported by world class infrastructure. The Government of Gujarat has enacted ‘The Gujarat Special Investment Region Act-2009’ and has come into force on 6th January, 2009. The concept of SIR has been evolved in concurrence with Delhi-Mumbai Industrial Corridor, a high impact industrial area within 150 km distance on both side of Dedicated Freight Corridor (DFC) admeasuring 1499 Km from Dadri-NCR to JN Port-Mumbai. The Government of India is setting up a multi-modal Dedicated Freight Corridor (DFC) between Delhi and Mumbai. Out of the total 1483 km of the length of DFC, 38% is falling in the state of Gujarat. The area of 150 km on the both sides of the DFC will be developed as DMIC. It will be a high impact industrial corridor. In line with DMIC goals, the Gujarat Government is setting up Dholera Special Investment Region (SIR). It is envisaged to be developed as a global manufacturing and trading hub supported by world class infrastructure. The state government has allocated 28000 hectare of land for the DSIR. DSIR has been planned over an extensive area of land measuring approximately 920 sq km and encompassing 22 villages of Dholera Taluka in the Ahmedabad District. It will be one of the largest city in India planned along the DMIC corridor. Dholera SIR will have smart and sustainable infrastructure, optimised water resource management in place, clean power, efficient drainage system and ultra modern urban design. The project goals envisage focussing on creating and providing a conducive environment to protect and provide growth avenues for local industries, improve the investment climate, and improve quality of life, human resource development and creating a world class infrastructure paving way for global investment. The proposed economic activity in the region includes Heavy Engineering, Automobiles and Auto Ancillary, Electronics, Hitech and Emerging technologies / high value add industries, Pharmaceuticals & Biotechnology, Metals & Metallurgical Products, General Manufacturing, Agro and Food Processing and IT/ITeS. To be developed twice the size of Delhi City and six times that of Shanghai. The upcoming region is rated by Forbes as one of its kind cities in India and one amongst the top twelve fastest growing cities globally. A Special Investment node along the DMIC corridor. It’s a government supported self-governed economic region offering options for fast track trading and manufacturing activities. The development plans are undertaken jointly by Gujarat State Government and Central Government. The region provides excellent connectivity through road, railways, highway, international airport, metro corridor and port. The region with be linked with Ahmedabad city with metro rail system. The proximity to sea port and closeness to the international airport makes it an excellent choice for businesses to set up shops in the region. The region provides good value proposition for investors in terms of land available at a lower cost. The development of Dholera SIR offers a plethora of opportunities for both local and international investors. The opportunities include residential township, industrial park, knowledge city, retail spaces, entertainment zone and hotels. The infrastructure development opportunities include constructing roads, airport, rail network, metro corridor and airport. Dholera SIR is taking care of the ecological and environment issues targeting lowest carbon footprint through harnessing wind and solar power for energy consumption. The opportunities to develop such power assets are immense for companies to partner and profit. The Dholera Industrial Park also called as “Activation Area” is spread across an area of around 22.5 sq km within Town Planning Scheme 2 in Dholera SIR. The area has approximately 72 km of roads and has an optimum mix of land uses comprising of industrial, residential, mixed use, recreation, and tourism. The area has been selected based on immediate availability of land and its future status after implementation of TP scheme (area with highest opportunity of commencement of site work). The area has existing connectivity to SH6 via the Coastal Road in the north of the site. The Activation Area is approximately 4.25% of the total developable area of DSIR. It is estimated to accommodate a residential population of 1.2 lakh with an employment of approximately 80,000 persons by 2020. Activation Area is having major portion of Government land (approx. 80%) which will provide ready to move plots with all major trunk infrastructure at the door steps of each plots. A building complex has been envisaged for the City/Node SPV/State Government Agency to administer and oversee the development works for the DSIR. In view of the above, an Administrative and Business Centre of Dholera (ABCD) Building Complex is being developed located on the Western side of the proposed Expressway in the northern portion of the DSIR. The ABCD building complex will house the administrative functions related to development activities and will accommodate the offices of the Nodal/City level SPV along with an Exhibition and Business Centre and a utility building. Cube Construction Engineering Ltd (CCEL) is executing the construction of ABCD building complex. The work has started in April, 2016 and likely to complete by December, 2018. Central Spine for Dholera SIR would be Ahmedabad-Vataman-Pipli-Dholera-Bhavnagar six lane Road. The proposed road would serve as central spine for Ahmedabad-Dholera SIR. It is decided that initially the road will be four lane with six lane structure. It could be access controlled. The road is supposed to connect the Ahmedabad city on one hand and Dholera and Bhavnagar ports on the other side. It is envisaged that the new industry cluster to be developed along the spine would considerably benefit with central linkage. It will also act as catalyst to other developments in the region in general and that of SIR in particular. This is also a part of master plan submitted to central govt. for DMIC road connectivity. This is approved by the central govt. The Dholera Industrial City Development Ltd (DICDL) has awarded the 10 MLD sewage treatment plant work to L&T on Engineering, Procurement and Construction (EPC) basis. Two streams of 5 MLD STP will be taken up in the current phase. The STP will be expandable up to 30 MLD to cater to future requirements of Dholera City. The Government of Gujarat has given in principle approval to 5,000 MW solar park in Dholera Special Investment Region (SIR). The proposed park is likely to attract investment worth Rs 25,000 crore. Dholera greenfield airport is being developed to provide connectivity to global destinations. It’s coming up near Navagam in the Dholera taluka of Ahmedabad district.The proposed airport aims to connect Dholera SIR with other parts of the county and is likely to handle the increasing traffic from the nearby cities like Vadodara, Rajkot, Bhavnagar, Nadiad and Anand. The airport development is likely to boost the economic development of the region. The airport project would make use of eco-friendly solutions and sustainable technologies and keep carbon footprint to the lowest. AECOM is currently involved in a number of smart city projects coming up in the DMIC corridor. AECOM team of professionals are involved in the DSIR project. The team was involved in the conceptualization of projects including feasibility studies and preliminary designs. They are providing program management services, helping the development authorities to plan, integrate, package, administer and manage the implementation of DSIR projects. L&T has already started work in Town planning Scheme no 2 out of 6 town planning scheme which lies at village Dholera and surrounding area of 22.5 sq km. The contract value is around Rs 1750 Crore. The Activation area requires the development of sewage collection and treatment systems as essential facilities for the development. Also, there will be recycled water distribution system with the treated water from the STP as the recycled water will reduce the load on the potable water demand. L&T is executing 10 MLD sewage treatment plant at a cost of Rs 53.9 crore. IT major Wipro Ltd is appointed as a consultant for setting up Information & Communication Technology (ICT) infrastructure in the region. The ICT facilities would include integrated operation centre, e-governance, data centre, city wide network and city dashboards. Shyam Group is one of the active real estate developers at Dholera SIR Gujarat. The Group is developing Pinnacle City residential plotting development projects at Dholera SIR. The project is specially designed for the people who are willing to invest in small amounts. Employer’s Engineer for Supervision Works for Roads and Services in Activation Area and ABCD Building in DSIR on EPC basis. VGC in consortium with Total Identity B.V. The work on the Administrative and Business Centre for Dholera (ABCD Phase-I) is progressing well. The project cost is worth Rs 73 Crore. The work on the Central Spine road has already started. Airport project has got all the clearances from MOEF, GOG and GOI. Survey work of TP-1 and TP-2 is going on for demarcation of Roads. PricewaterhouseCoopers co. is appointed as Transaction Advisor for Dholera International Airport. Town Planning Scheme no. 3, 4, 5 and 6 have been submitted to Apex Authority (GIDB) on 13/12/2012 for sanction. Dholera Industrial City Development Corporation is formed as a project SPV. Centre Government has allocated Rs. 3000 cr. for DholeraSIR. The Dholera Smart City project is likely to provide a vibrant economy promoting walk-to-work concept, smart transport, incredible opportunity for individuals to grow with high level of productivity, clean environment based on renewable energy, ample opportunities for both domestic and foreign businesses to set up shop using Single window clearance option, and sufficient legal dispute address mechanism for sorting out trade issues. The city is likely to provide robust infrastructure, multi-modal transportation network, exemplary policy framework, and freedom of operations. The hi-tech city would have malls, entertainment zones, helipad, golf course, super speciality hospital, landscaping in public places, advance MRT system, sports facilities, etc. The development of Dholera Sir Gujarat has been divided into three equal phases, each with 10 years of gestation period. The Dholera Smart City is likely to become operational in 2019 becoming India’s first smart city. The city would be home to close to one lakh population and with several industrial units commencing operation providing employment and churning out goods. The development plans shall continue till 2040. On completion, the city would offer world class infrastructure to business operating in the region and high standard of living for the residents. The technology is likely to play a big role in managing and optimising the City services and infrastructure. The city has a huge potential for development as a multi-modal transportation hub due to lesser distance to all the northern Indian States.